Readers of this blog will know how much I like making busy bags! I've been putting together some busy bags with a Christmas theme. Some of them will come with us when we go on holiday before Christmas, and the others will be ready to pull out for a Christmas activity when we need something to fill a bit of time. Most of these activities also require glue, I use white PVA glue. Some of the pieces within the bag came from Christmas craft kits which I always keep an eye out for in the post-Christmas sales when they can be heavily reduced. This really simple activity has kept mine busy for ages. All you need are some pipe cleaners and some plastic beads, the "pony beads" with a large hole in the centre are ideal. Children can easily thread the beads onto the pipe cleaners and the fuzz holds them on firmly so they don't fall off and they don't get frustrated. When they have finished threading the bracelets can be bent around the wrist and worn. 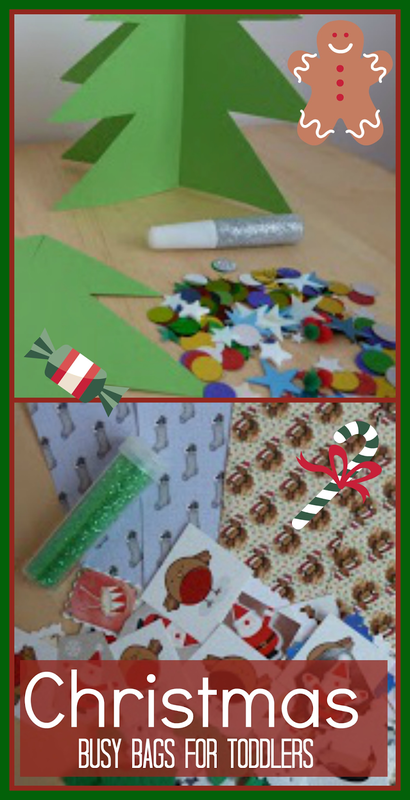 Collect together a selection of Christmas themed background papers, some Christmas images cut from last year's Christmas cards and Christmas advertising leaflets and magazines, some pre-cut foam shapes and a tube of glitter for good measure. You could also add Christmas stickers, sequins, stars, scraps of coloured paper etc. Provide the child with a glue stick and let them get creating. You could use their finished projects to make Christmas cards. I cut out some simple Christmas tree shapes from green card. Each decoration requires two shapes, one with a slit cut from the bottom up to the halfway point and the other cut with a slit from the top down to the halfway point. They can then be slotted together to make a tree that stands up by itself once decorated. I've included a selection of sequins and coloured stars and a tube of glitter glue to decorate and you will be left with some lovely child-made Christmas decorations. These craft bits and pieces were from a Christmas craft kit, but you could easily make your own if you have some pom poms and foam sheets. This kit makes a Father Christmas and a snowman. 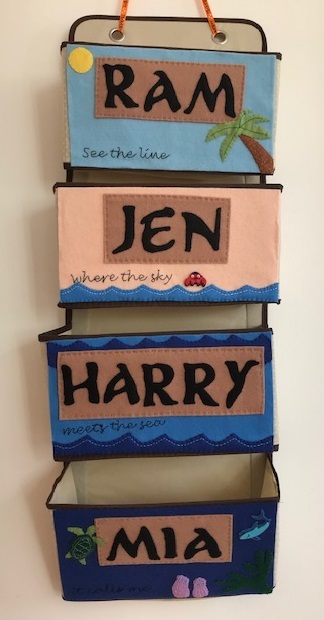 Pom poms can be quite difficult to stick together so you need to make sure that you use plenty of glue, and smaller children will need help with this. To hold the contents, I use small resealable sandwich bags from Ikea. The individual bags can then be stored in a larger bag or shoebox. You can find more of my Christmas crafts on my Seasonal Crafts page.